The table below summarizes the presentation layer internal SPIs defined by Apache Isis. It also lists their corresponding implementation, either a default implementation provided by Apache Isis itself, or provided by one of the (non-ASF) Isis Addons modules. 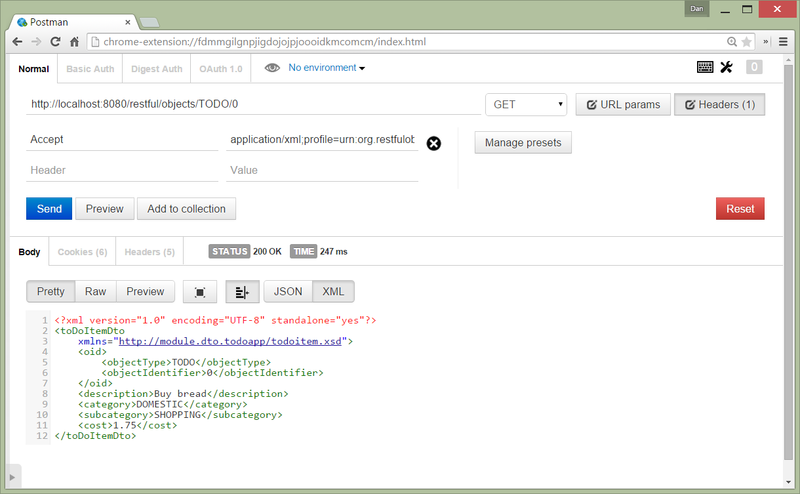 The Apache Isis framework provides a default implementation of ContentNegotiationService which inspects the "x-ro-domaintype" component of the HTTP Accept header. 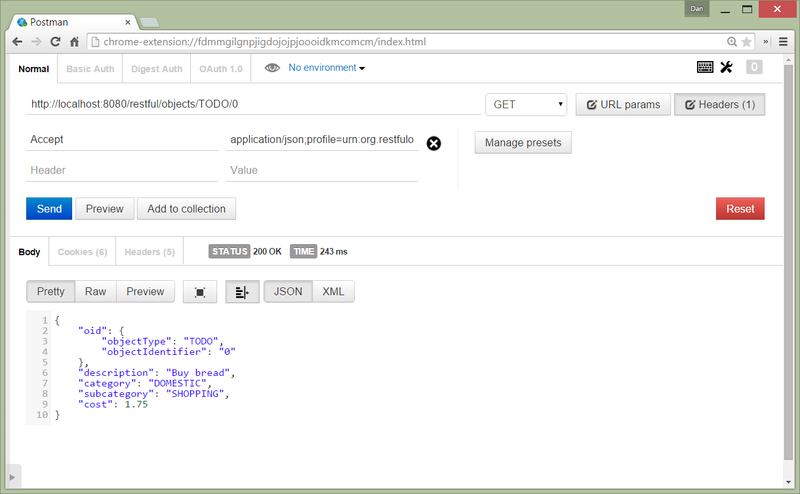 If present, this implementation will delegate to the companion ContentMappingService service, if configured. Assuming that the configuration-and-annotation services installer is configured (implicit if using the AppManifest to bootstrap the app) then Apache Isis' default implementation of ContentNegotiationService service is automatically registered and injected (it is annotated with @DomainService) so no further configuration is required. The default implementation generates representations according to the Restful Objects spec v1.0. However, it also delegates to the ContentNegotiationService which provides a mechanism for altering representations according to the HTTP Accept header. 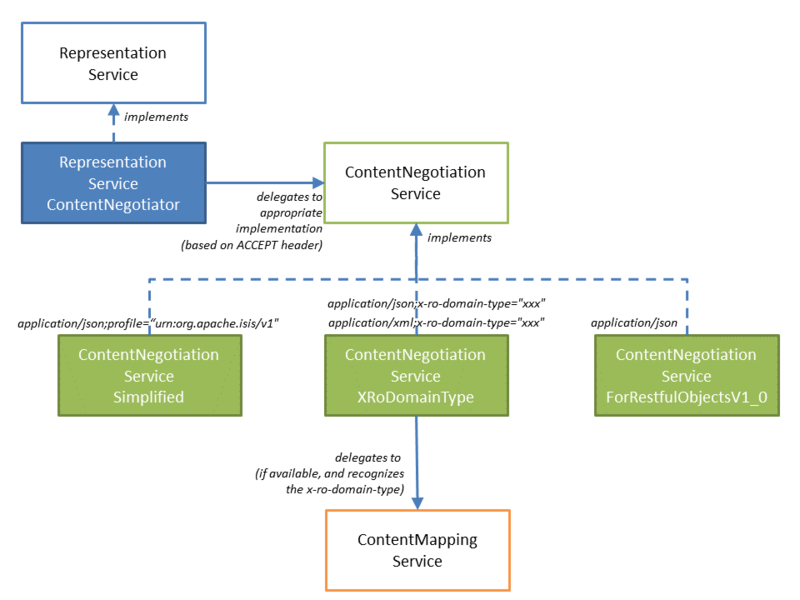 The RepresentationServiceForRestfulObjects is the default implementation of this service; likewise ContentNegotiationServiceXRoDomainType is the default implementation of the ContentNegotiationService. If you inspect the source code you’ll see that the default implementation of this service’s primary responsibility is to generate the default Restful Objects representations. Therefore, if you what you want to do is to generate a different _representation then in many cases replacing either this service _or the ContentNegotiationService will be equivalent (you’ll notice that their SPIs are very similar). As discussed in the introduction, the framework provides a default implementation, o.a.i.v.ro.rendering.service.RepresentationServiceForRestfulObjects. This delegates to ContentNegotiationService to generate an alternative representation; but if none is provided then it falls back on generating the representations as defined in the Restful Objects spec v1.0. Assuming that the configuration-and-annotation services installer is configured (implicit if using the AppManifest to bootstrap the app) then Apache Isis' default implementation of RepresentationService service is automatically registered and injected (it is annotated with @DomainService) so no further configuration is required. The table below summarizes the application layer internal SPIs defined by Apache Isis. It also lists their corresponding implementation, either a default implementation provided by Apache Isis itself, or provided by one of the (non-ASF) Isis Addons modules. (1.13.0-SNAPSHOT) Creates memento of current action invocation, for use as a serializable XML reified command. The most notable usage of this is to allow the execution of the Command to be deferred to run in the background (via @Action#commandExecuteIn() or @Property#commandExecuteIn(). (1.13.0-SNAPSHOT) Creates DTO for the current execution of an action invocation or property edit, for use either as a reified command or for implementations of the PublishingService. The CommandDtoServiceInternal (1.13.0-SNAPSHOT) is responsible for creating an memento of the current action invocation or property edit, to store in the Command object (from CommandContext). This memento is a JAXB DTO being an instance of the "cmd" schema, so can be reified so that its execution can be deferred until later, as a background command. The InteractionDtoServiceInternal internal domain service (1.13.0-SNAPSHOT) is used by the framework to create and update DTOs representing member executions, ie the invocation of an action or the editing of a property. The DTO is in all cases a subclass of MemberExecutionDto, from the "ixn" schema, and subsequently accessible from the Interaction object (per the InteractionContext service). The table below summarizes the persistence layer internal SPIs defined by Apache Isis. It also lists their corresponding implementation, either a default implementation provided by Apache Isis itself, or provided by one of the (non-ASF) Isis Addons modules. (1.13.0-SNAPSHOT) Co-ordinates between ChangedObjectsServiceInternal and AuditingService. (1.13.0-SNAPSHOT) Request-scoped service holding objects enlisted into current transaction. (1.13.0-SNAPSHOT) Co-ordinates between ChangedObjectsServiceInternal and MetricsService and the SPI services, PublisherService and (deprecated) PublishingService. The (internal) AuditingServiceInternal domain service (1.13.0-SNAPSHOT) acts as an internal facade to any configured AuditingService and AuditerService services. It is responsible for obtaining the details of all changes to domain objects within an interaction, and then to call the configured AuditingService to actually create audit entries of those changes. Assuming that the configuration-and-annotation services installer is configured (implicit if using the AppManifest to bootstrap the app) then Apache Isis' default implementation of AuditingServiceInternal class is automatically registered (it is annotated with @DomainService) so no further configuration is required. The ChangedObjectsServiceInternal class (1.13.0-SNAPSHOT) is an (internal) request-scoped domain service that is responsible for collecting the details of all changes to domain objects within an interaction. This is then used by various other (internal) domain services, notably AuditingServiceInternal and PublishingServiceInternal. Assuming that the configuration-and-annotation services installer is configured (implicit if using the AppManifest to bootstrap the app) then Apache Isis' default implementation of ChangedObjectsServiceInternal class is automatically registered (it is annotated with @DomainService) so no further configuration is required. The (internal) PublishingServiceInternal domain service (1.13.0-SNAPSHOT) acts as an internal facade to any configured PublisherService or (deprecated in 1.13.0-SNAPSHOT) PublishingService domain services. 2 the remaining parameters are to support the publishing of the action to any configured PublishingService services (deprecated in 1.13.0-SNAPSHOT). Assuming that the configuration-and-annotation services installer is configured (implicit if using the AppManifest to bootstrap the app) then Apache Isis' default implementation of PublishingServiceInternal class is automatically registered (it is annotated with @DomainService) so no further configuration is required.